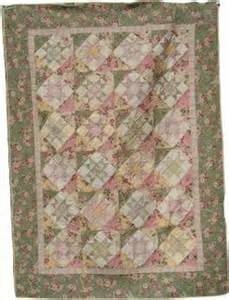 I am trying to locate the Hannah's Summer Wedding Quilt Pattern. I loss my directions and am now retired and would like to finish it. I'm hoping one of my readers will be able to help. In the meantime, though, when you tilt your head, you can see that this is a design made from alternating an Ohio Star quilt block with an Hourglass or quarter square triangle quilt block. The quarter square triangles are all made from the same four fabrics. The setting triangles are merely half a quarter square triangle block. If it was my quilt, I'd cut individual patches for them as half square triangles so that the straight of grain would be on the outside edge of the center field of blocks. There'd be less opportunity for those edges to stretch as the first border is applied. To my readers, for more pictures of this quilt and close-ups of the blocks, click here to go to www.cottagequilter.blogspot.com. If you know where the pattern can be purchased, please let me know using the 'comment' link below. Thank you! Pam, I hope this has helped at least a little bit. Wish I could have been of more help. I was looking at possible quilt patterns so I could make a quilt for my grandson and fiance and when I saw this quilt, I just loved it. I would appreciate a copy. I have not been able to find a clear picture either. The best part, her name is Hannah and they are being married next summer. I have this pattern, if you are still looking for it.